They also meet Josh’s teenage son, Paul (Callum Woodhouse), who appears to be hiding his sexuality from his homophobic father. There’s also one other guest, a hulking Russian called Alexie. 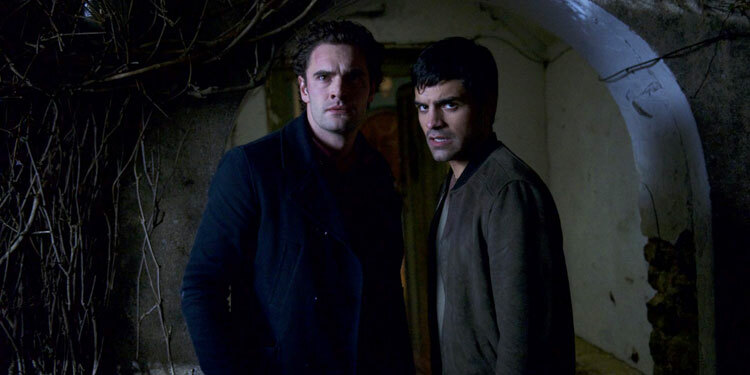 Marc is convinced that Alexie might also be gay, while Fred thinks he may be there for more sinister reasons, especially when he realises the Russian’s tattoos could mean he’s a killer. As the evening progresses things start to become increasingly dangerous as the B&B, resulting in violence and murder. But who is really the biggest threat? Is the homophobic Josh out for revenge? Is Alexie there to kill the gay couple? Does Paul have his own motives for murder? In the last few years it’s been nice to see gay-themed movies delving ever further into new genres. While B&B is far from the first gay horror/thriller, it is unusual for not putting its tongue in its cheek or relying on camp. There is humour and satire in the film, but this is a horror/thriller first and foremost, and not, unlike quite a few other gay horrors, an excuse to get buff young men running around screaming in their underwear. It’s certainly not tokenistic though, as sexuality is absolutely intrinsic to the plot and the motivations of all involved. Initially it does feel like it might be a film that’s merely going to use a hot button issue – gays vs. fundamentalist Christians – as window dressing, but as it progresses it becomes interestingly complex. Is Josh’s homophobia stronger than his love for his son? Are Marc and Fred guilty of stereotyping people in ways that make the situation worse? Has Paul managed to escape the effects of his father attitudes? 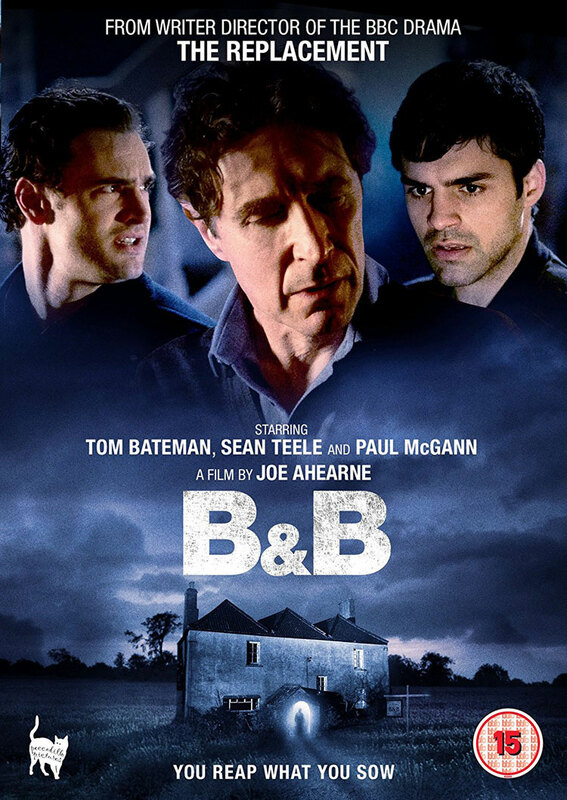 B&B also deftly sidesteps one of gay cinemas most intractable tropes, which is painting gay people as passive victims of the world around them. Marc and Fred have fought against homophobia and won, and they are certainly not just doe-eyed victims ready for the slaughter. In fact, quite the opposite, as some will find Marc a very unlikeable character. He is initially the definition of a bad winner, as he’s at the B&B to rub his court case victory in Josh’s face. Even when he’s in the right, he’s arrogant, pushy and prone to making the situation worse. In fact there are moments in the first half of the movie where he’s such an annoying prick, he verges on being unbelievable and he’s certainly difficult to empathise with. Conversely, while Josh is potentially dangerous and angry, the film has an unexpected sympathy for him at times, especially when he’s dealing with Marc. It’s interesting as it’s a very different way of handling LGBT characters and their ‘oppressors’ than is seen most comparable gay-themed movies – it also ensures it’s difficult to work out who the villains of the piece are, which is especially important for a film that wants to be a twisting, turning thriller, but which only has six speaking characters. And twist it does, keeping the viewer guessing as to exactly what’s going on, and using the characters’ and viewers’ prejudices to make assumptions about what’s happening, which are then turned on their head. Interestingly, despite its use of hot button social issues, B&B avoids making any grandiose statements about where it stands on the topics it raises (that said, some people have accused it of being preachy – but I think they’ve confused talking about an issue with preaching about it). It does hint towards homophobia causing problems that echo down the generations, but if it was going to have a message, it would be that gay people and B&Bs probably shouldn’t mix, whether they’re run by gay fundamentalists or not. Ultimately the film doesn’t add up to an awful lot, but it has some tense sequences and does a good job of keeping you guessing about what everyone’s motivations are and what will happen next. Overall Verdict: A slightly unexpected gay-themed horror-thriller, that keeps the viewer guessing in a way that may be ultimately inconsequential but which is fairly entertaining. Good review but this being a “DVD” review: How is the image? The sound? Are there any extras?